The M18 FUEL 1/2 inch Compact Impact Wrench w/ Pin Detent is the Most Powerful tool in its class by delivering up to 220 ft-lbs of torque in a compact design. The POWERSTATE Brushless Motor not only provides unmatched power, but also provides greater efficiency, delivering up to 25% more run-time than the leading competitors. REDLINK PLUS Intelligence is the most advanced electronic system on the market, preventing damage to the tool and battery caused by overloading or overheating. REDLITHIUM Batteries (not included) deliver more work per charge & more work over the life of the pack than competitive batteries on the market. The 4-Mode DRIVE CONTROL provides greater control over output speed & power for greater versatility by delivering 0-900 RPM in Mode 1, 0-1600 RPM in Mode 2, & 0-2500 RPM in Mode 3. Auto Shut-Off Mode intelligently detects when tool has impacted on a fastener for one second & automatically shuts the tool down, reducing the likelihood of overdriving & damaging materials. DeWalt's 20V cordless impact wrench fits easily into tight spaces and delivers a robust 1800 inch lbs. of maximum torque to power through tough fastening jobs on masonry, metal and wood. Weighing only 3.4 lbs. with battery, the impact wrench gives you the ability to deftly drive and remove fasteners in a variety of work settings. When visibility diminishes, ignite three front-facing LED lights to shine on your work space with a 20-second shutdown delay. Plus, socket changes on this device are easily facilitated with a 1/2-inch pin-detent square anvil. Strong, compact, lightweight and forceful, this 20V cordless impact wrench easily squeezes into tight spaces and delivers a robust 1824 inch lbs. of maximum torque to power through tough fastening jobs on masonry, metal and wood. Weighing only 3.4 lbs. with battery, DeWalt gives you the ability to deftly drive and remove fasteners in a variety of work settings. When visibility diminishes, ignite three front-facing LED lights to shine on your work space with a 20-second shutdown delay. The M12 cordless 3/8 Impact Wrench delivers 1,200 inch lbs. of torque for the toughest fasteners, up to 20% more than the competition. The forged steel impact mechanism provides maximum durability. The compact, lightweight design allows for fastening in the tightest spots. REDLITHIUM Battery Technology outperforms the competition, delivering up to 60% more run time. Additionally, an on-board battery fuel gauge displays remaining run time. 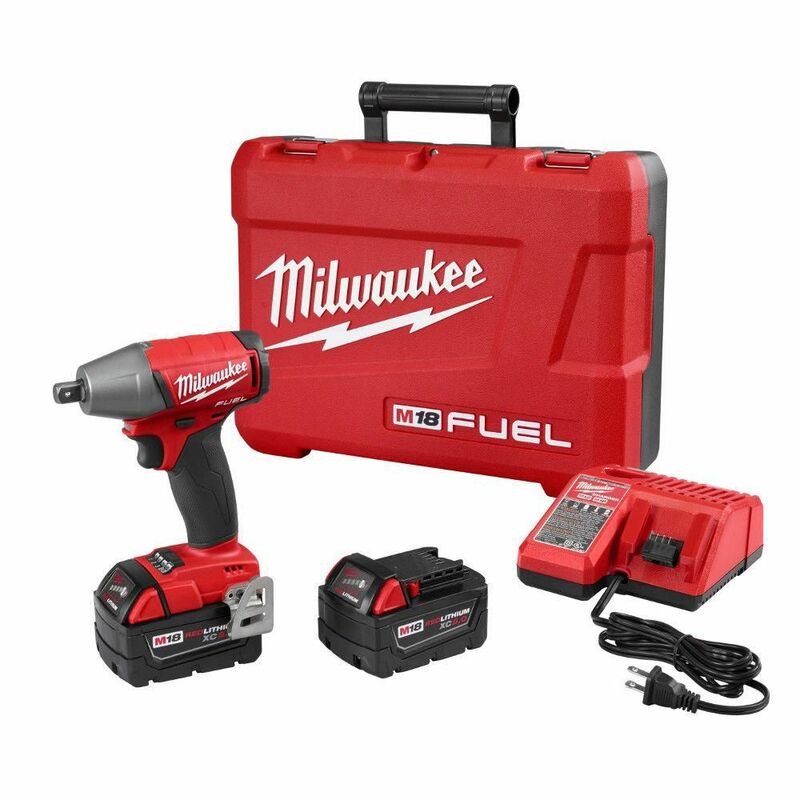 M18 FUEL 18-Volt Lithium-Ion Brushless Cordless 1/2-Inch Impact Wrench Kit w/ (2) 5.0Ah Batteries The M18 FUEL 1/2 inch Compact Impact Wrench w/ Pin Detent is the Most Powerful tool in its class by delivering up to 220 ft-lbs of torque in a compact design. The POWERSTATE Brushless Motor not only provides unmatched power, but also provides greater efficiency, delivering up to 25% more run-time than the leading competitors. REDLINK PLUS Intelligence is the most advanced electronic system on the market, preventing damage to the tool and battery caused by overloading or overheating. REDLITHIUM Batteries (not included) deliver more work per charge & more work over the life of the pack than competitive batteries on the market. The 4-Mode DRIVE CONTROL provides greater control over output speed & power for greater versatility by delivering 0-900 RPM in Mode 1, 0-1600 RPM in Mode 2, & 0-2500 RPM in Mode 3. Auto Shut-Off Mode intelligently detects when tool has impacted on a fastener for one second & automatically shuts the tool down, reducing the likelihood of overdriving & damaging materials. M18 FUEL 18-Volt Lithium-Ion Brushless Cordless 1/2-Inch Impact Wrench Kit w/ (2) 5.0Ah Batteries is rated 4.5 out of 5 by 8. Rated 5 out of 5 by Jay from Love this drill made for pro's ,went and bought the... Love this drill made for pro's ,went and bought the 2767-20 ,the big brother and the1/2 ratchet . I believe I won't have to buy a new impact gun for a life long time. Rated 5 out of 5 by Juan from This is a little beast. Used it for the first... This is a little beast. Used it for the first time on Sunday to change the struts and coil springs on my f150. I’m telling you I was surprised by the force and power of the impact drill, everything was a breeze. Removing the nuts from the tires piece of cake and struts 29mm lacking nut was sweet. Rated 1 out of 5 by Humberto from I thought it would be a good impact, but it was not like that, it has little strength. Could not... I thought it would be a good impact, but it was not like that, it has little strength. Could not remove the tires from my truck. Bad buy. Rated 5 out of 5 by Josh from Impact wrench. Works Great. The only problem is, if you wanna call it that, is that the detent pin is very strong. I need a nail or punch to depress it. Like the adjustable torque settings. 5.0 batteries are strong last a good amount of time. Rated 5 out of 5 by M18isbest from Fuel Impacts I put up grain bins for a living and use all M18 power tools on the jobsite. The most used is the 1/2" M18 impact. I started out with Dewalt and after a few disappointments went to Milwaukee. The Fuel is an unbelievable impact. I tighten over a million bolts a year and the impacts keep going. Often times I forget to switch out impacts and by the time I do, the impacts are so hot I cannot touch the metal encasing. I also have dropped a few from over 20 feet and they all kept running afterward. They may cost a little more but they are worth every penny. The only gripe is that when used constantly the belt clip screw tends to loosen and fall out. A little lock tight fixed the problem.